non-motorized outdoor recreational activity in the Hubbard County area. Section 1: The name of the organization shall be the Itascatur Outdoor Activity Club. 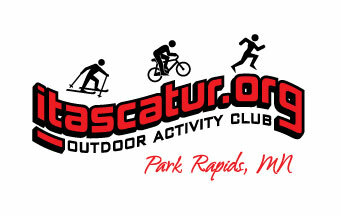 Section 2: The Itascatur Outdoor Activity Club is formed to promote physically healthy, non-motorized outdoor recreational activity in the Hubbard County area. Section 1: Application for voting membership shall be open to persons or families who meet one or more of the following criteria. Voting membership is limited to members 18 years or age or older. Working five hours either in preparation for, or at one or more of the club fundraising events such as the Headwaters 100 Bike Ride. Volunteer work at Soaring Eagle Ski trails for five hours or a half day. This work may include trail clearing, mowing, building and maintenance, or other non-paying activities. Section 2: Membership shall be granted upon acceptance. Section 1: The date of the regular annual meeting shall be set by the Board of Directors to take place in the first six months of each calendar year. Section 2: Special meetings can be called by the president, or a simple majority of the Board of Directors. Section 3: Notice of all annual meetings shall be given to all members at least 10 days prior to the meeting. Section 4: All member and board meetings shall be recorded by the secretary. Section 1: The Board of Directors includes the president, treasurer, secretary, ski director, bike director, and membership director and up to three at-large directors. The Board shall be comprised of no fewer than 7 and no more than 9 persons. They are responsible for the overall policy and direction of the club, and to delegate day to day operations. Section 2: The Board shall meet as needed at an agreed upon time and place and all such meetings are open to all members. Section 3: The Board of Directors may employ whatever personnel they deem necessary and for which funds are available and budgeted, to aid in the management of the club. The Board is authorized by the members to spend up to $1,000 for any single expenditure. The president shall oversee, in coordination with other board members and committee chairs, all events, functions and business of Itascatur. The secretary shall record meeting minutes and maintain club records as required. The bike director oversees, along with the president, all biking events, club rides, and biking social activities. The bike director submits a financial report to the treasurer at the conclusion of any fund raising event. The ski director oversees, along with the president, all ski events, club races, fall trail clean-up, new trail development, sign and building maintenance, grooming, group skis, and skiing social events. The ski director submits a financial report to the treasurer at the conclusion of any fund raising event. The ski director also acts as the club liaison with the Minnesota Department of Natural Resources. The membership director oversees the membership roster, and invites and introduces new members of the club. Section 6: Election procedures: Voting shall take place with one vote for each member. Absentee ballots will be received online at the Itascatur email site. This ballot will not be in secret. More than one member may vote per email address if such address hosts more than one Itascatur member. Absentee voting will take place the week prior to the annual election meeting. A secret ballot will be taken in person at the annual election meeting. Section 7: Notice. Any official annual meeting requires 10 days advance notice to all members. Section 8: Quorum: A quorum is 60% of the Board members. A quorum must be attained before motions may be made or passed, or business transacted. Section 9: Vacancies: When a vacancy on the Board exists, nominations for new directors may be received from the present Board members and general membership no later than five (5) days in advance of a Board meeting. All vacancies will be filled only to the end of that particular Board members term. Section 10: Resignation and termination. Any resignation from the Board must be in writing and received by the president. A Board member may be removed by a 3/4ths vote of the remaining directors. Section 1: Committees shall be set up under the Ski Director and Bike Director as needed to facilitate events and activities. Section 2: Finance Committee: The treasurer is chair of the Finance Committee which includes two other Board members. The Finance Committee is responsible for developing and receiving fiscal procedures, an annual budget, and a fund raising plan. The fiscal year shall be the calendar year. Financial records are public Information and shall be made available to the general membership. Financial reports will be submitted to the Board periodically, showing income, expenditures, and pending income. Section 1: These by-laws may be amended when necessary by a two-thirds majority of the Board of Directors. Proposed amendments must be submitted to the president to be sent out with regular Board announcements. be reproduced without prior consent.